But times change and so has the fortune of the Penguins. The team, now approaching its 50th anniversary, has much to be proud of. To ring in the start of hockey season in Pittsburgh, try our Penguins Trivia. The Penguins were one of six teams who entered the NHL in 1967, when the league was expanding, doubling the size of the NHL to 12 teams. Four of those six teams remain with their original names in tact. Which two teams from the group of six in 1967 are no longer in existence with their original names? The Penguins weren’t the first NHL team in Pittsburgh. The first NHL team in Pittsburgh had their name stolen by another team. In what year did the Pittsburgh Penguins change the team’s colors from dark blue, light blue, and white to black and gold, and which NHL team protested the move? On April 7, 1974, this Penguins goalie became the last NHL goalie to play without a mask. Before there was Iceburgh, the Penguins mascot, the team had a real live Penguin mascot who sometimes made an appearance on the ice in between periods. What was this real Penguin’s name? This Pittsburgh NHL coach was the first to change players on the fly. Before legendary broadcaster Mike Lange came on board, this broadcaster called games for one season in 1978-79. On March 13, 1974, while the Penguins were playing the Los Angeles Kings, this fad came to the ice. The Penguins have had at least one Dapper Dan Sportsmen of the Year in each decade since the team’s founding in 1967 but one. Which decade were they shut out? Mario Lemieux won the NHL Allstar MVP three times: in 1985, 1988, and 1990. Only one other Penguin has been named the Allstar MVP. Who was it? Four sets of brothers have played for the Pittsburgh Penguins on the same team. Name them. Who was the first Penguin ever drafted in 1967? Who was the first non-Canadian ever drafted by the Penguins? Who was the first American drafted by the Penguins? Who was the first Russian drafted by the Penguins? In 1972, the Penguins set the record for the most goals in 2 minutes and 7 seconds. How many goals did they score in that short amount of time? The Penguins hold the record for the 4th longest playoff game. They beat the Washington Capitals in the 4th overtime period 3-2 at what minute mark? Name two former Pittsburgh Penguins players who have gone on to coach a Stanley Cup winning team? The California Golden Seals flopped and became the Cleveland Barons, which also floundered. The Barons merged with the other defunct team, the Minnesota North Stars, which later became the Dallas Stars. 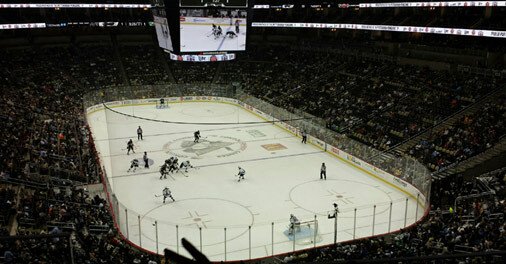 The NHL Pittsburgh Pirates played here in the late 1920s. In January of 1980, the Penguins reverted to black and gold, which the city’s previous NHL team, the Pittsburgh Pirates, had worn. The Boston Bruins protested because those are the Bruins’ colors, but the Penguins cited the Pittsburgh Pirates as having worn them in Pittsburgh when they played in the 1920s. Odie Cleghorn, who coached the Pittsburgh Pirates. A woman streaked the ice wearing nothing but a baseball cap. The 1970s saw no Penguins player, or member of the management, pick up a Dapper Dan award. Kevin & Kip Miller, Doug & Greg Brown, Chris & Peter Ferraro, and Alain & Mario Lemieux, who played one game together during the 1986-87 season.